Manufacture number 3327 cream. In the background are pine needles. The fabric is not as bright as the picture shows. Junebug and Companions Fabric Collection-5 Yds Total-FREE US SHIPPING! I can fit up to 7 yds. in the flat rate envelope, 18 yds. in the flat rate box, and up to 30 yds. in the new large flat rate box. We can fit up to 9 yds in the flat rate envelope or up to 24 fat quarters. It is a great print with a large white floral pattern on a deep navy blue background. You can never have enough fabric in your stash. You can never have enough fabric in your stash. It is from the Bohemian Blues series and is a great print with roses and vines on a wood plank patterned background in shades of cream and tan. You can never have enough fabric in your stash. It is from the Fields of Blue series and is a pretty floral gradient design in shades of blue. You can never have enough fabric in your stash. It is from the Audrey series and is a pretty print with tiny red flowers in a vine pattern on a deep black background. You can never have enough fabric in your stash. It is from the Noir series and is a great floral coordinate print in natural white/ecru on a black background. You can never have enough fabric in your stash. It is a pretty print with colorful flowers in a striped pattern on a turquoise blue background. You can never have enough fabric in your stash. It is a great print with fairies flying allover on a star, flower and snowflake covered pale pink background. You can never have enough fabric in your stash. It is from the Santorini series and is a great coordinate striped print with floral filigree style designs. You can never have enough fabric in your stash. It is from the Bohemian Blues series and is a great blue tone on tone print with roses and vines on a wood plank patterned background. You can never have enough fabric in your stash. It is from the Revive Cosmopolitan series and is a pretty print with navy, rust and cream flower designs on a stone gray/blue filigree floral ribbon design. You can never have enough fabric in your stash. It is an adorable print with colorful owls on a pink tone on tone owl outlines and white floral outlines on pink background. You can never have enough fabric in your stash. It is from the Fields of Blue series and is a pretty design with tossed blue flowers on a tan leaf and brushed taupe background. You can never have enough fabric in your stash. It is from the Bohemian Blues series and is a great print with a floral and leaf pattern shattered with icy shards of blue triangles. You can never have enough fabric in your stash. It is from the Tis the Season series and is a gorgeous print with poinsettia bunches, pine cones and pine bough bunches and golden music bars and notes allover on a natural off white background. You can never have enough fabric in your stash. It is a great print with green tropical leaves tossed allover on a natural off white background. You can never have enough fabric in your stash. It is from the Bohemian Blues series and is a great print with a floral and leaf pattern shattered with shards of tan triangles in a cream and tan pattern. You can never have enough fabric in your stash. It is from the Revive Cosmopolitan series and is a pretty print with cream and rust flowers with an artistic water wave design on an antique navy background. You can never have enough fabric in your stash. 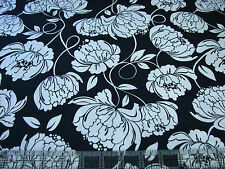 It is from the Noir series and is a great floral coordinate print in black on a natural white/ecru background. You can never have enough fabric in your stash.